The most significant ladder jump after round 14 came from Claremont who went from eighth to sixth after leading all the way to beat Swan Districts at Bassendean in one of the upsets of the season. The Tigers showed they’ll be a bit of a nuisance in the weeks to come with ruck dominance from Mark Seaby and effective work in the midfield from Luke Blackwell, Ryan Neates and Ben Daniher. Mitchell McGovern, another of former Docker Andrew’s boys, also looked good and kicked two goals. Full back Brandon Franz had his best game of the year. Tim Geappen kicked four goals for Swans and Adam Faulkner also played strongly. It was tight at Leederville and there were signs of a possible upset when Kepler Bradley and Tom Sheridan wandered over from Subiaco Oval to take their places in the Peel team midway through the second quarter. They’d been held over by the Dockers as emergencies for the derby and released after the players made it through the banner safely. George Hampson kicked the last four goals of the game to propel the Lions to a 26-point victory. Kyal Horsley was again superb in the midfield and Frank Stockley had a great battle in the ruck with Jonathon Griffin. Laine Wilkins looked good for the Thunder and impressive big man Michael Apeness kicked two goals and marked well. 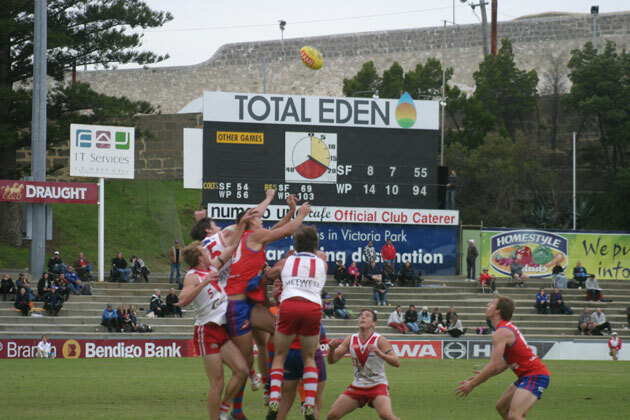 The Sunday game at Fremantle Oval started with a bang with each team kicking 6.5 (41) in the first quarter and the lead changing frequently. Some horrible field kicking from South Fremantle helped the West Perth cause and the Falcons were on top by half time and blew the game away in the third quarter. 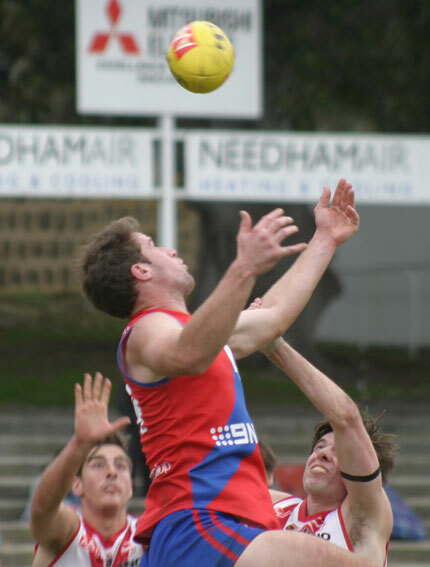 Nick Rodda marked powerfully and kicked five goals for West Perth, busy midfielders Shane Nelson, Aaron Black and Rohan Kerr caused havoc and Matt Johnson kicked three goals in a welcome return to form – he is a beautiful kick for goal. Ashton Hams, unlike many of his team mates, used the ball well for the Bulldogs, Craig White kicked three goals and worked hard and Adam Gugliemana tried to keep his team organised. Ladder: East Perth 40; Swan Districts 40; Subiaco 36; East Fremantle 32; West Perth 24; Claremont 12; South Fremantle 12; Perth 12; Peel 8. Next week: Claremont play South Fremantle at the Showgrounds in a game that could enhance South’s wooden spoon prospects and give the Tigers an unlikely flicker of hope. Perth will play their first game under new coach Trevor Williams against the Sharks at East Fremantle Oval. East Perth play Peel at Leederville after playing Williamstown at Subi on Tuesday in a Foxtel Cup semi final. And in the game of the round it’s West Perth and Swan Districts at Joondalup. 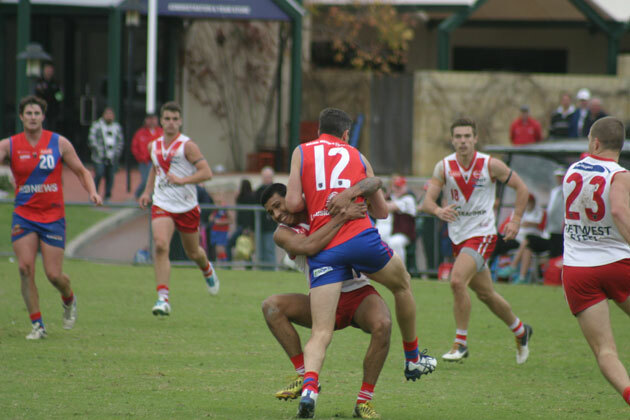 UP AND ADAMS: West Perth’s Marcus Adams marks in a pack of Bulldogs. Photo by Les Everett. 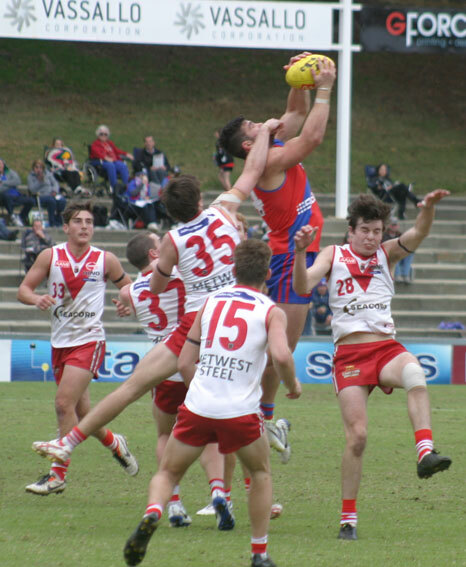 This entry was posted in Footy and tagged Marcus Adams, Nick Rodda, WAFL, West Perth Football Club. Bookmark the permalink.